All sparkling wines start life as still wines and have the sparkle added later. The crucial factor in the quality of sparkling wine is how the fizz is added.The fermentation process naturally produces carbon dioxide gas (CO2) – the waste product of the yeasts devouring the sugars. In still wine making this gas is allowed to escape. In sparkling wines, the CO2 is retained, dissolving within the wine which is kept under pressure. When it is released, the CO2 bubbles to the surface.The method for producing a wine filled with CO2 varies from the very time-consuming and expensive Champagne (or ‘Traditional’) method of natural, secondary fermentation in individual bottles, to the inexpensive and easy method of squirting industrial CO2 into cheap, still wine. The Champenois are justifiably proud of their wines and the age old methods used in their creation. Legend has it that the method was invented by a monk and winemaker named Dom Pérignon. Champagne itself can come only from a very well defined area in the north east of France, but many quality wines are made using the “Méthode Champenoise” (this term is no longer allowed on labels, so the term “traditional method” is often used instead). First of all, a high quality, dry white wine is made (usually from a blend of chardonnay, pinot noir and pinot meunier grapes) with ordinary tank fermentation. Once the wine is complete it is placed into special, heavyweight bottles and a fresh dose of yeast and sugar is added. The bottles are then capped and placed in the cool cellars of the winery for several years. During this time, a secondary fermentation takes place. The yeasts and sugars create CO2 that, because it is in a sealed container, cannot escape, so dissolves into the liquid. In the early days Champagne production was a dangerous business – cellars were regulalry damaged by exploding wines. Controlled production methods and stronger bottles have eliminated that risk. A chellenge with this technique is the deposit of dead yeast cells that collects in the bottle. In still wines these would simply be filtered out, but since filtration would also remove the bubbles, another method had to be found. This process is known as Remuage: an action whereby each bottle is shaken lightly, revolved and its position adjusted, so that over the course of a few weeks the bottle ends up upside-down with the dead yeast cells captured in the neck. The Remueur can precisely adjust 40,000 bottles per day. At this stage the inverted bottles are carefully transported to a freezing tank. The necks are dipped in, just to the level of the gathered sediment, which freezes into a solid plug of dead yeast cells. The caps are removed and the gas pressure shoots the plug out. Depending on the style of wine being made (dry, medium or sweet) the bottles are topped up with a ‘dosage’ of reserved wine and sugar. The bottles are corked, wired and at that stage, the Champagne is complete.Though this process is long, expensive and labour intensive, no other method produces wines with such fine and persistent bubbles and such a creamy complexity on the tongue. 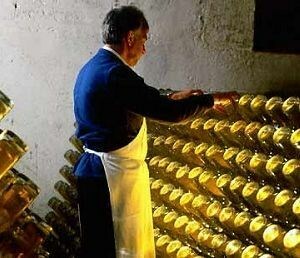 This is a different process by which good quality bubblies can be made. Here the secondary fermentation still takes place naturally, by adding new yeast and sugar to a finished wine, but instead of taking place in bottles, the wine is held under pressure in large sealed tanks so that the equivalent of several thousand bottles re-ferment at the same time. The wine is cleared of sediment and bottled under pressure, directly from the tank. The bubbles are a little larger and disperse more quickly, but the tank method can produce good results. Almost all Prosecco is made by this method. filtration in sealed conditions and pumped under pressure into clean bottles. Like sparkling wines, there are a variety of methods for making sweet wines. These vary from cheap and easy, to some of the most labour intensive and expensive processes in the winemaking world. We are talking here about fully sweet wines, often drunk with desserts, though the French like to partner the finest foie-gras with a luscious Sauternes – perhaps the king of sweet wines. Like so many aspects of winemaking, the discovery that grapes left on the vine until they rot can produce beautiful wines, was probably yet another accident. 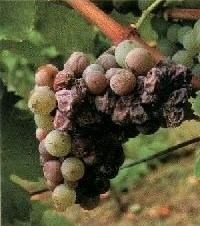 Botrytis is a fungus which may attacks grapes, usually in the cool of late autumn. It occurs in the early morning mists which form in vineyards sited near bodies of water. The fungus wraps itself around the grapes and spores puncture the skin, drawing off water and leaving the grape shrivelled. If left unchecked, botrytis can be a big problem to vine growers. In some unique locations (Sauternes in France, parts of Germany and Austria for example) the vineyards are sited such that they also get maximum exposure to the sun. In good years, the warmth of the sun as it rises kills off the fungus, leaving the grapes shrivelled and unsightly, but tasting delicious: full of concentrated sugar and glycerine which was left behind. Vineyards for botrytis wines are harvested by hand, so that only those individual grapes affected by the ‘noble rot’ are selected. Often the same area will be picked over several times so that grapes can be picked in ideal condition. The wine is then made using the normal method for white wines, but the high sugar and glycerine content means that the wine is sweet, luscious and full-bodied. Because grapes high in natural acidity are used (sémillon, sauvignon blanc, riesling, gewürztraminer) the wine is not at all cloying. Though sweet, the best wines are balanced and full of subtle flavours that linger on the palate. Botrytis wines are always expensive and often bought by the half bottle. With the unpredictability of the harvest and the labour intensive methods used, it is perhaps easy to see where the money goes. Some other sweet wines are produced from grapes that are over-ripened, but not rotted. This can be done by simply leaving the grapes on the vine for longer than usual, or harvesting the grapes as normal but leaving them spread out to dry on mats so that they shrivel in the sun and air. One interesting, rare and expensive form of sweet wine is the ice-wine (in German, Eiswein) of Germany, Austria and Canada. Here the grapes are left on the vine into the dead of winter – often into the new year. On a suitably freezing cold night the grapes are harvested. Most of the water content of the grapes has turned to ice and this is expelled from the grapes leaving only the flesh, sugars and acids behind in the pulp. A wine is made from this which is very luscious and sweet. Another group of sweet wines are sweet because fermentation is stopped at a fairly low alcohol level. At that point, there is still plenty of natural sugar that has not been consumed by the yeast, so the resulting wine is naturally sweet. Fermentation is usually stopped by filtering out the yeasts, but in some wines the fermentation is stopped by adding spirit to the tank: this is the basis of the great sweet, fortified wines such as Port and Madeira, as we shall see in the next section. The cheapest method of making a dessert wine is simply to add sugar. In the best cases this will be natural grape sugar, in the worst, sacks of cane sugar. Although these wines are sweet – and may please some palates – they are usually lacking in balancing acidity and interesting flavours. The term fortified indicates that the wine’s alcoholic strength has been boosted by the addition of spirit, usually a grape based spirit, like brandy. Fortified wines can be sweet or dry, depending on whether the spirit is added during or after fermentation of the base wine. The family of sweet fortified wines include Port, Madeira, Malmsey, Banyuls and Muscat de Beaumes de Venise. Again, the quality of these is only as good as their components: a good base wine and a good quality spirit. About half way through fermentation (with an alcohol level around 5°) a measure of spirit is added to the tank. This immediately raises the alcohol level. Yeast cannot survive in alcohol levels much above 15°, so the fermentation stops and all the unfermented sugar is left in the wine. The resulting wine is both strong and sweet. It is normally transferred to oak barrels at that point for ageing. Originating from the Douro valley of Portugal, port comes in various styles and quality levels. In particularly good years (usually two or three per decade) a ‘vintage’ year is declared and a vintage port is released. Vintage ports are the aristocrats of the port world and often take around 30 years after release to develop into truly great wines. These should not be confused with Late Bottled Vintage (or LBV) ports: these are ports which have been matured for longer than ordinary ruby or tawny ports in the shippers’ cellars, but they are not true vintage ports of a great year. LBVs are ready to drink when they are released. From the island of the same name, Madeira is unique in that after being made – in much the same way as port – it is cooked. The wine is placed in barrels in the hot lofts of the wineries, or in cheaper wines, in heated vats (over 50° centigrade) for 90 days. Once again this was an accidentally discovered technique – Madeira wines being shipped in the holds of sailing ships on long voyages were kept in very hot conditions which seemed to caramelise the wines – a flavour that people seemed to enjoy. This fortified wine (usually manufactured on an industrial scale in the north of Italy) is flavoured with wormwood or other herbs. Sherry, from Jerez in Spain, is perhaps the greatest wine made by the post-fermentation method. In other words, unlike port, the spirit is only added after fermentation is complete. All sherry therefore, starts life as a completely dry style. Varying amounts of sweet reserve wine are added back in before bottling, according to the style of sherry being made. Another unusual feature of sherry making is the ‘solera’ system of ageing. In the solera system, wine from many vintages is matured in the cellars in separate casks. The casks containing the oldest sherry are constantly topped up with wine from the second oldest casks. These in turn are topped up with wine from the third oldest casks, and so on until the newest casks – from the current vintage. In this way, the style of sherry can stay much the same from year to year as all sherry is a blend of several vintages. Fortified wines typically range from around 16° to 22° of alcohol – almost double the strength of ordinary wines. can be made white or rosé. Although rare, there are examples of red sparkling wines, such as the deep red, sparkling syrah from Australia. Most Champagnes tend towards a dry, elegant style, but many other sparkling wines (such as Asti-Spumanti for example) are lighter in alcohol and sweet, or semi-sweet. have varying levels of sweetness and are often a golden yellow colour. Their taste is often described as honeyed, whilst toffee and caramel notes are common too. Many will display flavours of white fruits: peaches, pears, melon, etc. here the overwhelming flavour comes not from the wine at all, but from the herbs used as flavouring agents. comes in many styles and quality levels, but the characteristics are just like those of fine red wines: vintage ports can be tannic and overpowering when young, but can mature over many years so that the fruitiness and sweetness re-emerges. also appears under a huge variety of guises. Most sherries are commercial blends, made with consistency in mind: to taste the same year after year in a pleasant but uncomplicated style. There can be a lot more to sherry than that however: some fine, old, dry sherries develop wonderful walnutty, warm scents and flavours quite unlike any other wine. The finest, true fino sherries are produced when a strange substance called ‘flor’ grows on the top of the open cask as the sherry ages. Flor is a yeast compound, which prevents the sherry from oxidising and adds subtle complexity to the flavour. Most sherry is made principally from the palomino grape, but look out for sherry made mainly from the pedro ximénez grape: these are intensely sweet: wonderful poured neat over good vanilla ice-cream!